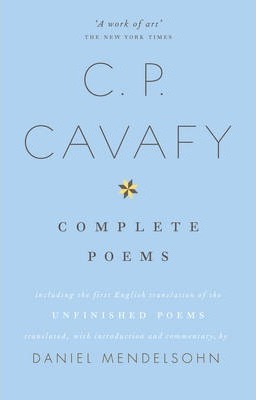 The complete Cavafy poems – including the unfinished works – in a stunning new translation.From the acclaimed author of `The Lost’, a translation that scales new heights in modern poetic rendering. With a masterful eye for irony and an ear for the music of Cavafy’s form, Daniel Mendelsohn’s translation brings to English the poet who won acclaim from generations of writers, E.M. Forster and T.S. Eliot among them.Spanning the fall of Homeric heroes to the rise of the modern world, Cavafy’s poetry collapses the spectra of time, geography and age into intimately personal elegies. Works such as «Waiting for the Barbarians» and «Ithica», famed for their revival of the ancient worlds, continue to address the modern reader in terms of timeless relevance. Here they are accompanied by Cavafy’s unfinished poems, translated into English for the first time. From a highly respected classicist and social essayist, Daniel Mendelsohn’s edition is uniquely placed to become the fresh, definitive edition of Cavafy in English.